This tree came down over Doe Run in East Marlborough, on powerlines, as local residents come out to inspect the damage. Numerous roadways across Chester County were closed early Tuesday due to flooding, trees down and power wires down. 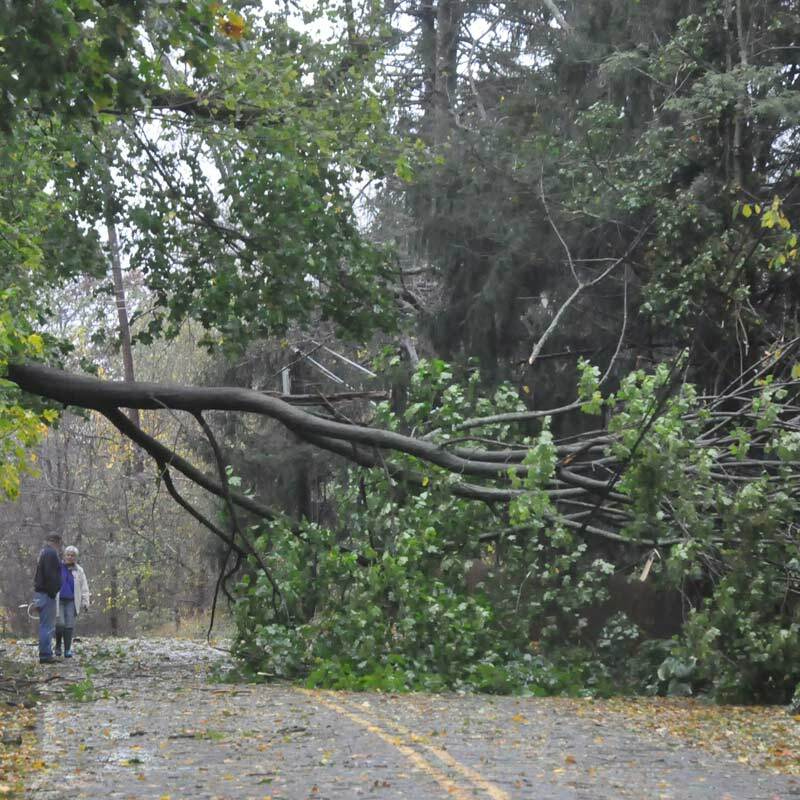 Hurricane Sandy let much of Chester County off easy, but downed trees, closed roads and widespread power outages were still major challenges for local residents, first responders and local government officials, Tuesday. Here’s what we do know as of midday Tuesday: according to PECO more than 50,000 Chester County residents lost power Monday, repair crews w out working to restore power. Some local residents expressed frustration at the company’s customer service line, which atypically would not offer guidance as to when power would be restored. 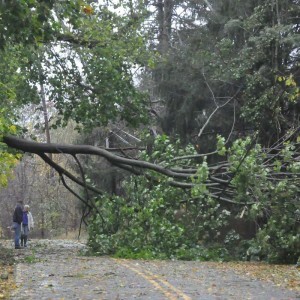 PECO announced later in the day tat some 800,000 homes in southeast Pennsylvania lost power. Roughly 300,000 haven restored, the company said. PECO said it would have repair estimates after 4 p.m. Tuesday, but calls as late as 5:45 Tuesday showed no change and no estimate for homeowners in southern Chester County. Numerous roads in the area are closed with trees and wires down, or because of flooding. 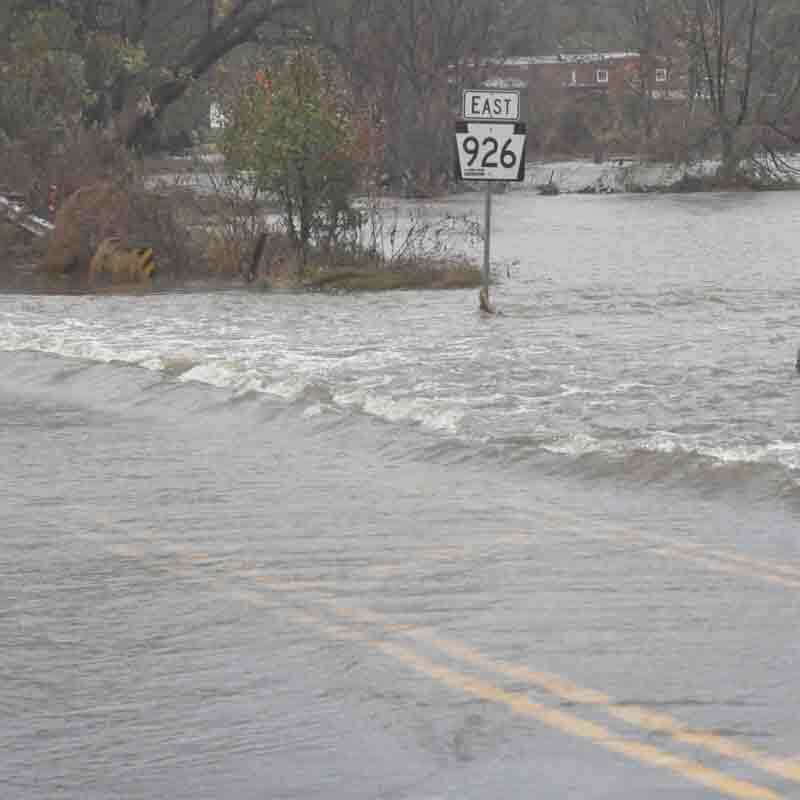 Route 926 remains closed at the Brandywine, while Route 82 was closed near the West Marlborough-East Fallowfield border. Doe Run was closed near Route 926 because of a large downed tree. While the Brandywine reached peak flood of 13.7 feet, the water did recede when low tide came in, but did cause localized flooding along its route. The Brandywine Creek rages across Route 926 in Pocopson, as floodwaters begin to drop Tuesday. Chester County announced that it had extended the period to accept absentee ballots through Thursday, Nov. 1, but it was unclear as of mid-Tuesday whether county offices would reopen Wednesday or Thursday. Unionville Chadds Fords schools will reopen Wednesday. The community conversation on bullying planned for Oct. 29 has been rescheduled for Nov. 5. We were very thankful that we did not lose power or trees. Mother Nature decided to spare us this time. We hope that Sandy is not a trend of the future.